In June I wrote a few posts about John Dinnis (1816 – 1894), and I need to add a few details here. John was married to Charlotte Robinson, and their first child was a daughter named Catherine Ann Dinnis. 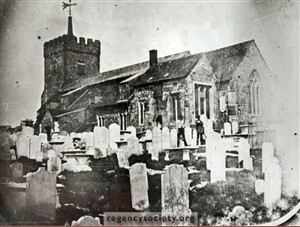 I recently joined the Sussex Family History Group (www.sfhg.org.uk) and discovered Catherine Ann was Baptised at St Nicholas Church, Brighton on August 2nd 1837. There are other details on the document, John, Charlotte and Catherine were living in Middle Street, Brighton and John’s occupation is listed as ‘servant’. The church has a website (www.stnicholasbrighton.org.uk) where I went to find more information. The church is dedicated to St Nicholas, the patron saint of sailors and fishermen and is the oldest church in the area dating back to Saxon times. There is still a beautiful Norman Font, of Caen Stone which is considered by experts to have been built carved in 1170. St Nicholas was the Parish Church of Brighton until 1873, and it underwent a major restoration in 1853. Among it’s ‘noted worshippers’ is the Duke of Wellington. There are some lovely images of the church on the website www.gravelroots.net. This entry was posted in Catherine Ann Dinnis, Charlotte Robinson, John Dinnis and tagged Brighton. Bookmark the permalink. What an incredible church! Lovely history you have . . .